Western blot analysis of extracts from HeLa, NIH/3T3 and C6 cells, using the CTMP Antibody. Flow cytometric analysis of HeLa cells, using CTMP antibody (blue) compared to a nonspecific negative control antibody (red). 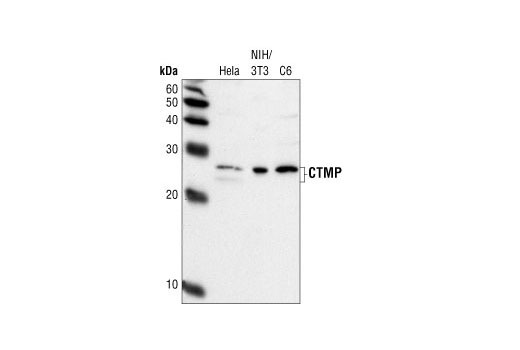 CTMP Antibody detects endogenous levels of total CTMP protein. Polyclonal antibodies are produced by immunizing animals with a synthetic peptide corresponding to residues of human CTMP. Antibodies are purified by protein A and peptide affinity chromatography. Carboxyl-terminal modulator protein (CTMP) is a negative regulator of Akt and was identified as an Akt binding protein. Akt, also referred to as PKB or Rac, plays a critical role in controlling the balance between survival and apoptosis (1-3). This protein kinase, activated by insulin and various growth and survival factors, functions in a wortmannin-sensitive pathway involving PI3 kinase (2,3). Akt is activated by phospholipid binding and activation loop phosphorylation at Thr308 by PDK1 (4), and by phosphorylation within the carboxy-terminus at Ser473. CTMP binds to the regulatory domain of Akt at the carboxy terminus of the protein and inhibits phosphorylation on Thr308 and Ser473 (5).